Following this afternoon's OS X 10.8.2 update, which adds Facebook integration and other goodies to Mountain Lion, OS X 10.7.5 is available for Lion users. The big addition to Lion is Gatekeeper, which is a security feature that allows you to choose whether 3rd party applications can run on your Mac or not. For new Mac users, it's an excellent security option for those purchasing and only allowing software from the Mac App Store. For developers, allowing 3rd party apps is critical for development tools and other third party applications from vendors. Thankfully, it's easy to use, and works the same on Lion as it does on Mountain Lion. Apple has pushed out a series of bug fixes as well, and we'll be posting a direct download link to the combo update and add release notes once they're available. In the meantime, Lion users will want to check Software Update for the latest download. Announced last week, Avatron's popular utility Air Display, a $9.99 app that can turn any iOS device into an external display for a Mac or PC, has been updated today to include support for two major new features and technical achievements: HiDPI mode and Retina graphics. Meant to be enjoyed on the new iPad's Retina display, Air Display 1.6 requires the installation of a desktop application that will handle the wireless connection between Lion and the iOS app. Apple just released a "supplemental update" to OS X 10.7.3, resolving "an issue when restoring a Mac from a Time Machine backup." Apple also adds in the release notes: "This update is recommended for users running 10.7.3 with Time Machine backups." 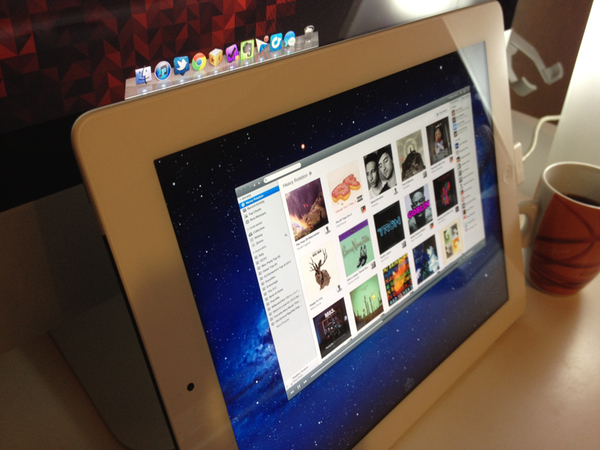 OS X 10.7.3 was originally released on February 1, adding a number of fixes and improvements to Lion. The update is now available on Apple's website, and through Software Update as a 38 KB Delta update for users running 10.7.3. A few weeks ago, I tweeted I'd like to see some sort of Twitter client with its only focus being on Favorites -- I keep Twitter open all day, and I save a lot of links. Prior to ending up in my Evernote or Pinboard accounts, the tweets I want to "save for later" are marked as favorites, which, I believe, provide an easy way to use a built-in Twitter functionality for general-purpose "bookmarks" that I may or may not consider for a post or more serious bookmarking in a second service. As you can see, I have a lot of favorites. The same is true for other services I use on a daily basis, such as Google Reader, Vimeo, YouTube, or Instagram: I like to be able to "star", "like" and mark things as favorite so a) the service knows the stuff I'm interested in and perhaps will leverage this data sometimes in the future or b) perhaps other apps will. And while I'm still waiting for the ultimate app that looks at your Internet favorites and delivers content intelligently to you every day (albeit Zite is on the right path), it turns out someone has built a functional and nice-looking desktop aggregator called Favs. Favs for Mac is in beta, so don't expect a full review now -- the developers are still polishing the interface and adding features, and it wouldn't make sense to give a final verdict whilst the app is still being worked on. But the underlying concept is there, and it's one of those things I've been looking for: a single app that collects favorites from a variety of services. The list is pretty impressive already, and I assume it can only grow before the final release. I don't know what else I'd add to that list (multiple accounts are already supported) as most of the services I use are already covered -- perhaps some kind of Evernote and Instapaper integration, though I honestly can't imagine how Evernote could work with Favs. Right now, I'm just happy Favs is shipping with a solid selection of services, and I like how the developers also implemented a unified inbox for all your favorites. Favs, in fact, uses the old Tweetie-like interface with narrow sidebar + right panels (the one we've already seen in a multitude of Mac apps such as Sparrow and Reeder) to lay out service icons, unified inbox, and controls to manage settings and refresh all services. The app supports Lion's full-screen mode, which is probably a good choice considering you'll want to run Favs as a standalone app that is not your main Twitter or Google Reader client, as it's focused on letting you view items that you wanted to save for later. Obviously one could easily dismiss this interface approach as "easy" or not innovative, but I believe this design can work for an application like Favs where you're supposed to quickly switch between sections (sidebar), take a peek at headlines (mid panel) and read the actual content (right panel). As I've said this is a first public beta, which means features like keyboard navigation, sharing and contextual menus haven't been implemented or refined yet. I was able to test Favs with my huge collection of Twitter favorites and it reliably loaded items from 500+ days ago without a single slowdown. I can only imagine things will get even better come the final release. To me, Favs is a web nerd's dream come true already. It's got my Twitter favorites, my Google Reader stars, the stuff I like on Instagram, and it even lets me add multiple accounts if I really want to keep tabs on everything I save online. I look forward to reviewing a final version in the future, and I hope the developers are at least considering an iPad version for this. 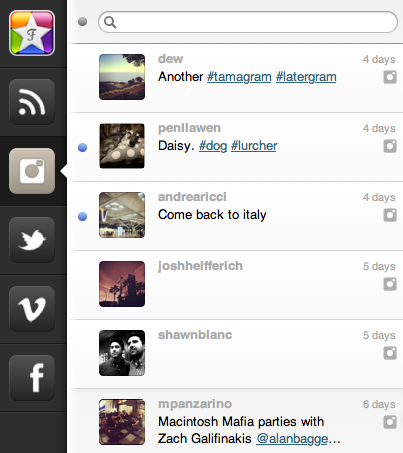 For now, you can download the Favs public beta for free here. A few minutes ago Apple released an update to OS X Lion, which reaches version 10.7.3 and brings a number of bug fixes and improvements. This new version of Lion includes "general operating system fixes" and support for more languages; 10.7.3 also addresses compatibility issues with Windows file sharing and directory services. One of the next versions of Firefox, Firefox 12, may feature a series of new interface elements and functionalities that should both appeal to OS X Lion users and introduce new navigation options for those who dont' want to save their-most accessed websites in a bookmarks bar anymore. As first noted by ExtremeTech, an early version of a proposed new tab page design snuck into a nightly version of Firefox; per Mozilla's multiple channel releases, users of Firefox can test different versions of the browser, which range from Nightly to Aurora, Beta, Stable, and those uploaded directly to Mozilla's FTP servers. The Firefox home tab is a lot more exciting. Basically there are two phases: The first phase will add “launchers” at the bottom — one-click links to your downloads, settings, apps, and so on (pictured right). Phase two is a complete reworking of the home page paradigm, weaving in favorite apps, recent websites, and even instant messaging (pictured below). Phase one is expected to roll out with Firefox 12, but at the time of writing the code still hasn’t been committed. However, as also noted in an update to the original post, it appears Mozilla has pulled the functionality from the Nightly release of Firefox, leaving it in the "UX version" available for download on Mozilla's servers. Upon comparing the standard Nightly build to the UX one, I noticed the latter already contains the grid design for top websites pictured above, and full-screen support for Lion. I wasn't able to activate ExtremeTech's home tab page design with search, Top Apps, Top Sites and Chat in a single window; the current Firefox UX Nightly build features shortcuts along the bottom of the window to open History, Settings, Add-ons, Apps, and Downloads. 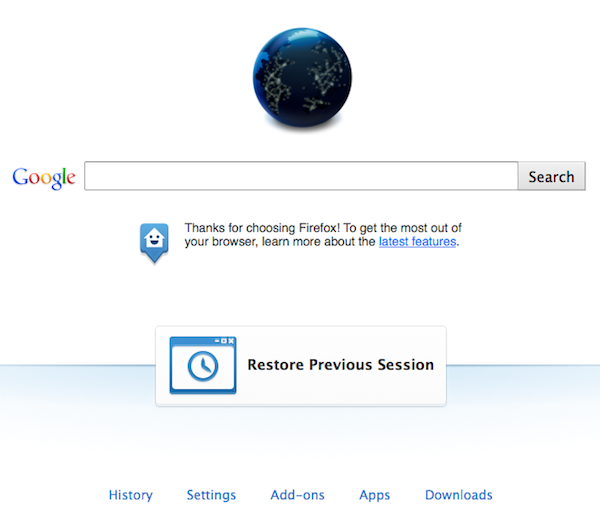 A new "Restore Previous Session" button is also provided in case you haven't set Firefox to automatically re-open previously open tabs on launch. Changes that appear in Firefox Nightly builds typically carry over to the other stages of development and are further tweaked with refinements and bug fixes, but there could be changes in the features that Mozilla decides to implement once version 12 hits the beta channel. As for Lion support, Mozilla failed to deliver any significant optimization since the OS' release back in July, unlike competitor Chrome which added new scrolling, full-screen support and gesture navigation (among other things) fairly quickly. A designer at Mozilla mocked up some ideas that the company could deliver in a future version of Firefox for Lion, but as of version 12 nightly (Firefox stable is currently at version 9) it seems those ideas haven't been taken into consideration yet. Yoink is a drag & drop assistant for Lion, in that it provides you with a virtual “safe zone” to temporarily store files — or rather, links to them — you want to move from one location (say your desktop) to another space or full-screen app. Yoink doesn’t “copy” a file, or multiple ones, to its shelf: it only acts as a bridge between the original file, and the destination of the drop. 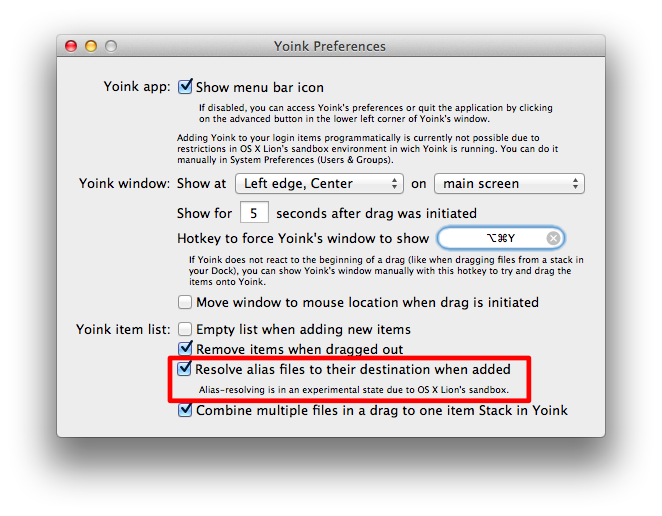 In its first version, Yoink was primarily meant to provide a better way to move files from the Finder to full-screen apps -- that is the reason the app was built with Lion APIs from the ground up. Yoink 1.0 undoubtedly offered a quick and elegant way to move files around apps and desktops in an intuitive manner; Yoink 2.0, released today, is a huge step forward that now allows the app to accept almost any kind of input from OS X, from text to images and web clippings from any app. 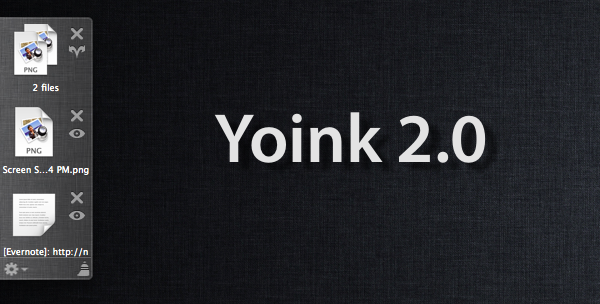 In accessing content from apps, Yoink has become more than a simple tool to temporarily store files that need to be moved around full-screen apps -- think of Yoink 2.0 as a secondary, visual clipboard that can accept almost any kind of file you throw at it. In my tests, besides dropping content from apps into Yoink's shelf, I've copied links, text and images from Safari and Chrome, and successfully watched Yoink create text clippings and full copies of the images ready to be pasted anywhere on my Mac, both in the Finder and other apps. Rich text from a web browser is converted to .textclipping once imported in Yoink, and you can easily re-export everything to the Finder, or into another app that accepts text, such as TextEdit or Twitter's compose window. Want to tweet a famous quote by The Beatles? Drag text into Yoink's shelf, open your client of choice, and drop your previously copied text. How about quoting someone else's words on your blog (and this is something I've been looking forward to)? Drag text into Yoink, fire up your blog's editor window, drop text. Yoink's new drag & drop system works with almost any app and any kind of content -- you won't be able to preserve the exact formatting of a rich text document when copying, but it surely works very well as a lightweight solution to quickly save plain text files. 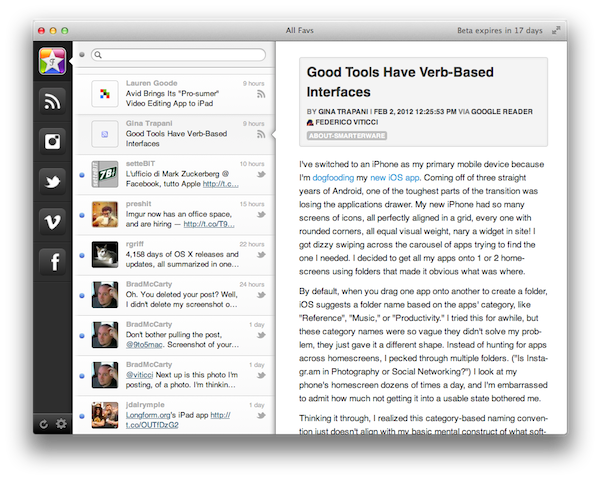 Yoink 2.0 brings a couple more interesting additions besides improved drag & drop. The interface has been redesigned to have more linen and the app can be assigned a keyboard shortcut; more positions for Yoink's window have been added and files shouldn't be lost anymore if they're moved from their original location. One issue I had (and already reported to the developer) was with an alias I moved from Dropbox to my Desktop, which didn't resolve correctly in Yoink and displayed a permission error. The error is likely happening because of some restrictions from Apple's sandboxing technology or the fact that the alias came from Dropbox -- Yoink 2.0 is capable of resolving aliases and, in fact, it worked fine with a file that was originally stored on my Desktop. Last, Yoink now comes with File Stacks, a neat way to drag and drop multiple files into Yoink's window and have the app combine them into one item in the shelf. This can be very handy if you're dealing with multiple images and PDFs and you want to get them quickly out of the way. At $2.99 on the Mac App Store, Yoink remains a fantastic way to enhance Lion's drag & drop with an app that acts as a temporary scratchpad/visual clipboard for content that you want to copy, move elsewhere, or simple save for later. Highly recommended, you can get Yoink here. Because we're nice folks who want to help the development community, we've decided to make the information we gather public (in aggregate form) so that you can also benefit from this knowledge. Below you'll find statistical information about all collected configurations to date. The information is provided as-is. We're not going to tell you exactly how many individual users have submitted the information, nor can we place any guarantee on the accuracy of this information. Remember, this is not a poll of the Mac OS X community at large, just a subset of our customer base. Looking at the data, you can see how OmniFocus (by far Omni Group's most popular app) shows a steep Lion usage increase in July (obviously), and a gradual growth throughout January 2012, whereas lesser known apps like OmniWeb have shown an initial decline in user adoption of the latest OS, then stable updates. Surprisingly, OmniOutliner users don't seem to upgrade to Lion much. As noted by AppleInsider, earlier today Apple seeded the first version of Lion's next update -- 10.7.3 -- to registered Mac developers. The build, labelled 11D16, is available both for Lion and Lion Server configurations. According to developers familiar with the release, the focus areas for 10.7.3 testing are iCloud document storage, Address Book, iCal and Mail. Apple warns developers that by installing the 10.7.3 seed, they will be unable to revert back to older versions. The latest version of OS X Lion, 10.7.2, was released on October 12th and delivered support for iCloud on the desktop, alongside other new features, fixes and optimizations. 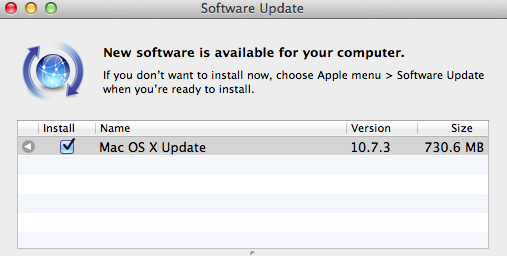 As with 10.7.1 before, 10.7.2 was released both through Software Update and the Mac App Store. If Apple's testing period for 10.7.2 (the OS was first seeded in late July) and 10.7.1 release are of any indication, 10.7.3 testing should require at least one month before it goes public.